Wayne shares recipes and ideas that will you give a little bit of yourself this season. Homemade gifts are always appreciated because they are personal and show that you are giving a little bit of yourself. If you are looking for holiday gift ideas, look no farther than your kitchen. Here are collection of recipes that will surely bring a smile to the faces of anybody who receives them. Some of these are my recipes, while others came from both my family and my wonderful Facebook friends. If you have a special recipe or two of your own, maybe this will inspire you to make it and package it up for gift giving as well. Prepare dough for the individual crusts by mixing together the margarine, flour and cream cheese until it forms a ball. Cut dough into 5 equal portions. Wrap them in plastic and refrigerate for 30 minutes to an hour. Meanwhile, combine remaining ingredients, except pecans, in a large bowl and set aside. Prepare mini cupcake pans by spraying them lightly with a cookie spray. Preheat oven to 350 degrees. Take each dough portion and roll it out on a lightly floured board to the thickness of a traditional pie crust. Using a 2 1/2" cookie cutter, cut circles from the dough. Place each circle into a cup in the pan and press it into the bottom and sides. Repeat with all the dough. Place about 1 teaspoon of filing into the bottom of each crust and sprinkle pecan pieces on top. Place in the oven and bake for 18 minutes or until edges begin to brown. 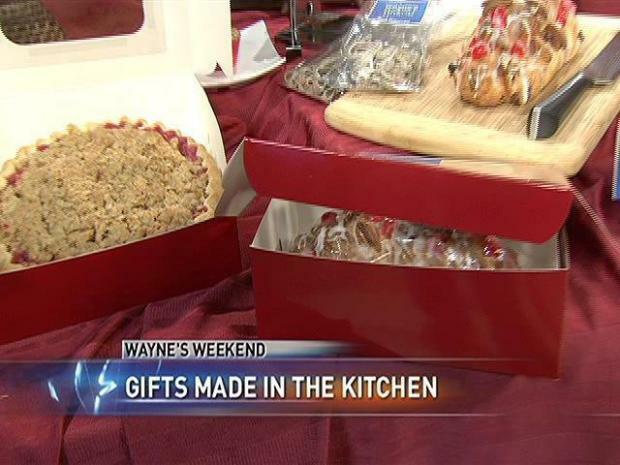 Wayne's Note: I actually only baked mine for about 15 minutes so be sure to monitor yours the first time you make them. Remove from oven and allow to cool. Store in airtight containers. My aunt actually stacks them in empty Pringle's cans for storing and gift giving. Prepare crust: cut margarine into small dice. Combine all three ingredients. Using your fingers, mix ingredients to form a dough. Knead briefly until smooth. Refrigerate for 30 minutes to an hour. Roll out dough on a floured board to a size large enough to fit your pie pan. Transfer to pan and press into the bottom and sides and then crimp edges. Set aside. Place cranberries and 1/2 cup of the sugar in a small sauce pan over high heat. Heat ingredients and stir until cranberries burst and begin to break down for about 3-4 minutes. Remove from heat and allow to cool slightly. Preheat oven to 350 degrees. In a large bowl, combine pears, apples, orange juice, zest, cornstarch, cinnamon and nutmeg. Add cranberries and mix well. Pour ingredients into prepared pie pan. Crumble together topping ingredients with your hand. Break ingredients over pie filling and press slightly to set the topping in place. Bake for 45-55 minutes or until crust is golden brown. If crust appears to be browning too quickly, tent the entire pie with aluminum. Combine candied fruits and the chopped nuts; mix well. Cream butter and sugar in a mixing bowl; add honey and molasses. Beat well; add eggs. Beat until well blended. Sift together the dry ingredients; add to first mixture and stir to blend. Blend in brandy or juice. Stir in fruits and nuts. Blend well. Fill well buttered and floured or paper-lined muffin pans. Fill to top. Cover muffins with buttered brown paper and bake at 300° for 40 to 45 minutes or until cakes test done. Muffin size determines baking time. Cool in pans for 10 minutes. Heat white corn syrup and glaze muffins; turn out of pans. Makes about 40 mini-muffins, fewer small to medium muffins. Karen DeLau sent me a note on facebook saying that she's planning on making homemade pasta and sauces as gifts this year. I just bought a pasta maker and haven't had time to develop my own recipes yet, so I experimented with this one below (but, I did a combination of white and wheat flour instead of all white as in the recipe). I like the result but I will keep experimenting. You should too! Dissolve yeast in water and set aside for 5 minutes. Then, add milk, sugar, salt, egg, shortening, lemon, mace, raisins, almonds half of the candied cherries and half of the flour to the yeast. Mix with a spoon until smooth. Add enough remaining flour to handle easily. Turn onto a lightly flour board and knead until smooth for about 5 minutes. Roll into a lightly greased bowl and then bring the greased side up. Cover with a cloth and let rise in a warm place until double takes about 1 1/2 hours. If your kitchen is cool, place dough on a rack over a bowl of hot water and cover completely with a towel. After dough has risen, punch down and let rise again until almost double takes about 30 minutes. Divide dough into 2 portions to make 2 loaves*. Divide each portion into 4 equal parts. Shape 3 of the parts into 14” strands. Place on a lightly greased baking sheet. Braid loosely without stretching and tuck the ends together. Divide the fourth part of the dough into 3 pieces and shape each into a 12” long strand. Braid these 3 strands and place this small braid on top of the large braid. Repeat with the other half of the dough to make a second loaf. Cover and let rise until double takes about 45 to 60 minutes. Heat oven to 350 degrees. Mix remaining egg with 1-2 tablespoons of water. Brush the braids with the egg glaze. Bake 30 to 40 minutes or until golden brown. Wayne’s Note: if bread appears to be browning too quickly loosely tent it with aluminum foil. Meanwhile, mix powdered sugar with 1 1/2 tablespoon of milk. Add just enough additional milk to create the smooth consistency of thick syrup. Chop the remaining cherries in half. 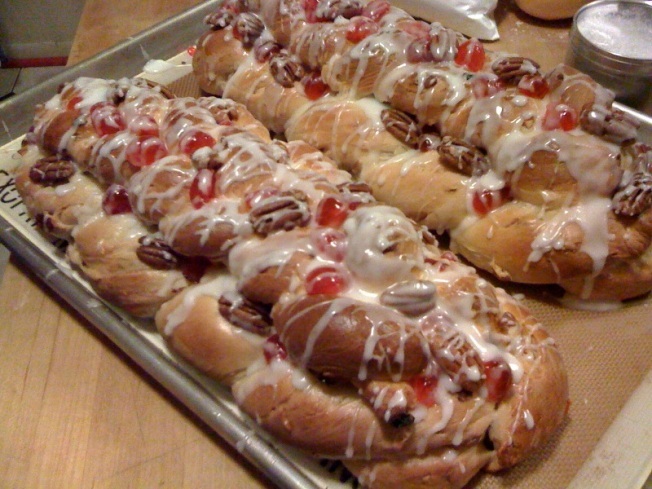 Decorate braids with pecan halves and cherries pecans and then drizzle with icing while still warm. * Wayne's Second Note: Rather than making 2 loaves with this recipe, I made 3. The large braids were only 10" and the smaller ones were 8". Cut margarine into small dice. Combine all three ingredients. Using your fingers, mix ingredients to form a dough. Knead for about 30 seconds and then roll out to form your crust. Roll out crust and line a pie pan. Crimp edges of crust using your fingers. Set aside. Place potatoes in a large saucepan. Add enough water to cover potatoes by about one inch. Add salt and bring to boil. Continue to cook until tender (about 20 minutes). Drain potatoes fully and mash with butter, granulated sugar and brown sugar until smooth. Add eggs, vanilla, nutmeg and cinnamon. Pour mixture into crust. Use aluminum foil to cover the edges of the crust to prevent it from burning during baking. Place pie into oven and bake for about 1 hour until filling is set. Remove the aluminum and allow the crust to brown further if needed. Cream together butter and brown sugar. Add cinnamon, nutmeg and vanilla and continue to blend until all ingredients are fully incorporated and mixture is smooth and creamy. Transfer mixture to a gift container with a lid. Keep refrigerated. Create a gift card that describes the preparation method: For each serving, mix 1 tablespoon of mix with 1/2 ounce of dark rum in a mug. Add 6 ounces of boiling water and stir until all ingredients are blended together. Garnish with freshly grated nutmeg. Pour Red Hots into a nice container suitable for gift giving. Pour powdered drink mixes on top. Include simple instructions for making individual beverages: Shake container before each use to mix powdered mix about. Scoop two tablespoons of dust coated Red Hots into a mug. Add 10 ounces of boiling water and stir until all the Red Hots have dissolved.